Barb is a native Montanan with ties to the Swan Valley stretching back two generations. Her paternal grandparents, Matt and Anna Hill, filed a homestead claim on Buck Creek in 1917. She and her husband Joe moved to the Swan in 1972 and fixed up the old homestead cabin where both her daughter and son were born. Barb’s children attended Swan Valley Elementary School where Barb served on the school board for some time. After working locally for the USFS for over eight seasons, Barbara returned to the University of Montana to obtain a degree in Forest Management. The family moved to Salem, Oregon where Barb worked for the Bureau of Land Management in both the coastal and Cascade forests. She retired from her job as forest ecologist managing both the invasive plants and prescribed fire program. Juanita oversees the fourth generation of E Bar L Ranch, a family-owned and operated guest ranch in the Blackfoot Valley. The ranch prides itself on its conservation ethic and long term range and timber management. Her community involvement includes the Big Blackfoot Chapter of Trout Unlimited; Sunset School Board, serving a small rural public school; the Missoula County Open Lands Committee; and fundraising for conservation easements in the Blackfoot as part of the Blackfoot Community Project. Juanita is also a member of Montana Conservation Voters, the Blackfoot Challenge, and Community Food Agriculture Coalition. Alex serves as a research professor at the University of Montana’s College of Forestry and Conservation. He has a PhD in the Human Dimensions of Natural Resources from Penn State and degrees in Environmental Science and Forest Resources. Alex's academic interests revolve around private lands conservation—building partnerships to encourage the stewardship of working lands. When not in his office, Alex can usually be found chasing various critters around western Montana with his fly rod, rifle, or shotgun or simply enjoying life with his family. Helene Michael was born and raised in Sweden. 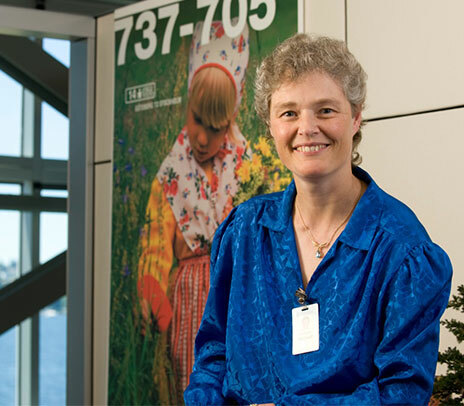 She graduated with a Bachelor of Science degree in Mechanical Engineering from Montana State University (MSU) in 1985 and went to work for The Boeing Company in Seattle as a manufacturing engineer, supply chain manager and manufacturing supervisor and director. Twenty five years later she retired as the VP of Manufacturing for the 737 Airplane. In 2013 Helene received her Honorary Doctorate in Engineering from MSU and has been actively engaged in the student mentoring program, Women in Engineering presentations and the Engineering Advisory Council. As of 2014 she is an active member of the MSU Alumni Foundation Board of Governors. Helene also serves as a board director for the Upper Swan Valley Historical Society. She and her husband Tom have been permanent residents of Condon since 2011. Professionally, Rich has followed an academic career. He works in philosophy, linguistics and computer science and has taught at Yale, the University of Pittsburgh, and currently at the University of Michigan. Since 1969 he and his wife Sally have owned land in the Swan Valley, near Cooney Creek, and he and his family, including their two daughters, have spent summers there since 1976. Over the years, they have become increasingly aware of the vital importance of sensible and sustainable forestry, and of land management practices that respect and enhance the landscape and its wildlife. The Thomason's are dedicated to these values. Larry is retired after a 30-year career in high tech. He worked with many of the creators of the networked computer industry in Silicon Valley, including Xerox and Sun Microsystems, as an engineer and executive. In 1990 he co-founded and became Chairman and CEO of Remedy Corporation. Larry retired in 2002 and bought property in the Swan that same year. Since then Larry has focused on family, philanthropy, fly fishing, and other sports interests. His primary interests in philanthropy are watershed conservation, Special Olympics, and applying entrepreneurism to the world’s challenges through his alma mater Stanford University. He is Board Member Emeritus of Special Olympics N. CA & NV and founder and board member of the Trust for Public Land Northern Rockies Advisory Board. Larry is also a member of the Native Fish Committee of the Swan Lands Coordinating Network and the Coldwater Conservation group of Trout Unlimited. Larry and his wife Pamela reside in Palo Alto, CA. They are frequent visitors to their property in the Swan Valley. Pam is a second generation Swan Valley native. She is a partner of a family-owned Heavy Hauling business. Pam is active in the local community as the President of Swan Valley Saddle Club and past Salmon Prairie school board member. Pam's interests are education and forest stewardship. Kathleen retired after 30 years of law practice in Havre, Montana. She has been an annual visitor to the Swan Valley since 1972, and purchased property on Kraft Creek Road in 1994. She and husband Bruce retired to the Swan Valley in 2013, where they enjoy attending classes and seminars on forest management. Kathleen has served on multiple non-profit boards of directors. Casey is a native Montanan and a member of the Confederated Salish & Kootenai Tribes. Casey currently serves as a hydrologist with the CSKT Natural Resources Department. He attended the University of Montana and received a B.S. in Geography and a M.S. in Forestry. Prior to accepting a position with the CSKT, Casey began his hydrology career with the United States Fish & Wildlife Service. In his spare time, Casey enjoys volunteering for various non-profit organizations and being an engaged member of the community. He also loves spending time in the mountains where he enjoys backpacking, skiing, fly fishing, and trail running. Mark's family has been farming in the Flathead Valley for over 100 years. After working 10 years in Alaska, Nevada, and Central and South America in the mining industry as a placer gold exploration geologist, he returned to Bigfork and for 20 years managed his plantation tree farm and native timber lot. Starting in 1998 Mark started working for the Montana Land Reliance as a seasonal land steward, and in 2008 he joined MLR full time as the Western Office Manager. In his spare time Mark enjoys hiking, backpacking, and fishing with family and friends. Mark holds a B.S. in Geology from Western Washington University. Mary first came to the Swan in 2009 with her husband Mark Benedict in search of the perfect place to spend Act III of their lives. They bought property in Salmon Prairie that fall and moved here from Ellensburg, Washington in August of 2017. Mary has a Master of Social Work degree from the University of Washington and worked for the City of Seattle and United Way of King County in planning and managing human services programs, grant making processes and public policy efforts. She also acted as a field instructor for several universities and taught program evaluation classes at the UW. Teaching, facilitating and data analysis are her favorite professional activities. She has served on a number of non-profit boards and enjoys being engaged in the community through volunteering. She now works from her home in Salmon Prairie as a systems analyst, supporting homeless management information systems software. Mary has a lifelong passion for the natural environment and enjoys most outdoor activities, especially cross-country skiing, hiking and kayaking. Scott has been a wildlife biologist for the Seeley Lake and Missoula Ranger Districts of Lolo National Forest since 2001. He began his career in resource management with a stint in the Peace Corps (Philippines 1989-1990) as an Agro-forestry volunteer. He has also worked as a forestry technician in the Lewis and Clark National Forest. Scott received his M.S. degree in wildlife biology at the University of Montana. His research with private, state, and federal agencies focuses on species such as pine marten, lynx, wolverine, and bears. Scott divides his time between his home in Seeley Lake and Meadowlands Ranch in Condon. He is a board member of Clearwater Resource Council and is engaged in a variety of local conservation and education based efforts. Russ is a retired trade association manager in Washington D.C. Russ was highly dedicated to Swan Ecosystem Center and awarded Director Emeritus status in 2014. Anne Dahl was a founding member of Swan Ecosystem Center, (now Swan Valley Connections) and served as its executive director from 1997-2013. She was an active member of the Swan Citizens’ Ad Hoc Committee, which formed in 1990 that later established Swan Ecosystem Center. Anne was awarded President Emeritus status in 2014. Steve came to Montana to serve as a Colonel for the USAF in Great Falls. He and his wife Betsey moved to the Swan Valley permanently when he retired. When in Great Falls, he served as president of the Island Range Chapter of the Montana Wilderness Association, and was a representative to the MWA council. Steve is a past volunteer firefighter with Swan Valley Emergency Services, and is an active member of the local AARP chapter. Steve has been on the board of Swan Valley Connections (formerly Swan Ecosystem Center) since 2004. Neil came to the Swan Valley as a boy in the 1950's. He is now a retired logging contractor, yet highly interested in sustainable forestry and sound land management. Neil has been recognized as Montana Woods Products Association Logger of the Year in 1995, and recently by Governor Steve Bullock with the 2016 Montana Good Neighbor Award. Neil and his wife Dixie, also a Swan Valley native, have been Swan Valley landowners for 55 years. Neil was a founding member of Swan Ecosystem Center, now Swan Valley Connections. Logging contractor. Owner of Double Ott Trucking and Timber Management. Swan Valley native. Dr. Lex Blood is a professional geologist and long-time Flathead educator. Lex has had a variety of educational and community roles as co-founder, president, and educator for the Glacier Institute, as a geology and geography instructor for 26 years at Flathead Valley Community College, as an Adjunct Professor of Geology for the University of Montana, and as the founder of the Crown of the Continent Ecosystem Education Consortium (COCEEC). Lex is currently the Managing Director of the Sustainability Fund and works as an independent geologic consultant. Jim has experience as both a rural sociologist and a forester. He received his academic training at the University of Washington and the University of Michigan, and his PhD dissertation explored the success of voluntary associations among small private woodland owners. Prior to becoming the Associate Dean, he was the Director of the Bolle Center for People and Forests at the University of Montana. For nearly 20 years he worked for the USDA Forest Service in Michigan, Ohio, Oregon, and Washington, with a three year assignment in Washington D.C. as a policy analyst in the International Program Office. Andrea's career spans 30 years of work in the fields of environmental education, classroom science teaching and, since 1999, designing and teaching college field programs. Seasonal experience as a leader of trail crews and volunteer biological survey crews for the Forest Service complements her academic training in geology and natural history. This background inspires her work on bridging the gap between conceptual understanding of the natural sciences and transformative field education.